Bridging Brown County, a non-profit organization whose mission is to strengthen Brown County by bridging relationships of understanding and communication, held its fifteenth annual networking dinner at the Springfield Area Community Center the evening of November 1. 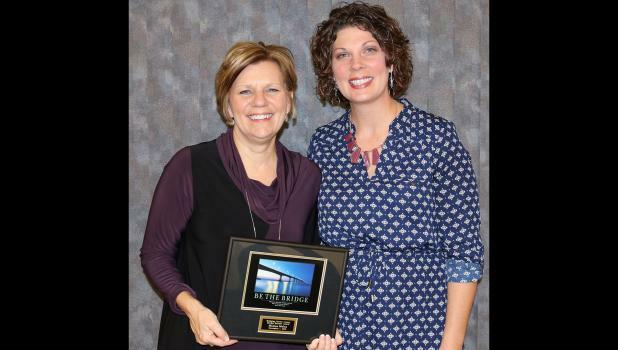 During the fundraising dinner, Maxine Meine of Springfield was presented the 2018 Bridge Builder award that goes annually to a resident of Brown County who exemplifies the organization’s mission. Maxine was born and raised in Comfrey and has lived her entire life in Brown County. Currently, she is the branch manager at South Point Financial Credit Union. She has been a past active member of the Springfield Community Theatre, Brown County Habitat for Humanity and Brown County United Way. Maxine is currently an active participant of the Brown County Pork Producers, Springfield Chamber of Commerce, St. John’s Auxiliary and St. Raphael’s Council of Catholic Women, church lector, EMC and choir member. She has been married to her husband, Steve, for 36 years. She has three children, son Andy and wife Erin Meine; and daughters and sons-in-law, Abby and Brian Schwartz and Angela and Andy Cook; as well as eight grandchildren. The networking dinner also provided an opportunity for past and present participants of the Bridging Brown County leadership program, as well as supporters of the organization, to come together for a fun-filled evening. Bridging Brown County would like to thank the many businesses who donated live and silent auction items. The support to the residents, businesses and organizations in Brown County is greatly appreciated.